Let's start with a simple keyboard shortcut. We want the spacebar to be a blackout button. So when we press spacebar, the whole output should go black. This is useful as a sort of panic button ("oh no, get it off mah screen! "), or to create tension before a big drop. You create shortcuts by opening the Shortcuts menu, and choosing which protocol you want to create a shortcut for. So go to Shortcuts > Edit Keyboard. The interface will now turn partially blue. You can also use CTRL-SHIFT-K as a shortcut to enter Shortcut mode. Shortcut-ception! Everything blue can have a shortcut assigned to it. 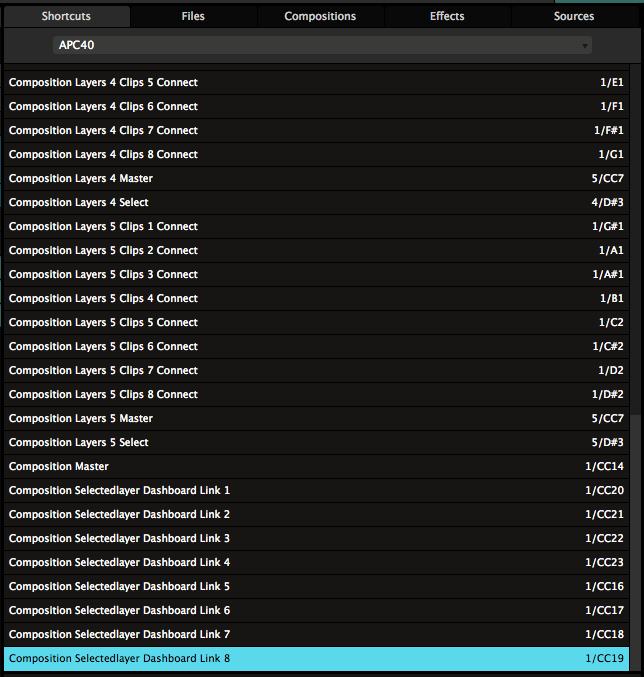 So find the Composition Bypass button in the top left of the interface and click on it with the mouse. Now press the spacebar, and voila, you've assigned your first shortcut! If the Bypass button was big enough, you could even read it had the spacebar assigned to it. Press the Escape key to exit the Shortcut mode, and you can now bash that spacebar to toggle the Composition Bypass on and off. On and off. On and off. On and off. Okay. Stop. That's enough. Let's dig a little deeper. Go back into Keyboard Shortcut mode, and select the Composition Bypass again. In the bottom right of the interface, you'll see the Shortcuts tab. This tab is only visible while you're in Shortcuts mode. In this tab, you can see all your keyboard shortcuts in a handy list. 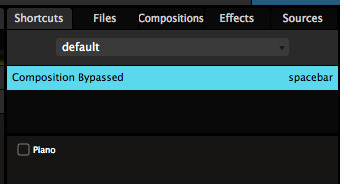 The Composition Bypass is a very basic control, it can either be on or off. Still, it has one option, namely "Piano". All buttons in Resolume can be set to Piano mode, which means that they will be on for as long as you hold the key down, and turn off when you release the key again. "But Resolume, that's not how a piano works at all!" Yes, you're right. Piano is easy to remember and reminds you that you're playing an instrument. If you prefer, you can call this option Momentary or Flash or whatever floats your boat. Once you enable Piano mode for a shortcut, you also get the option to Invert. This will let you turn the control OFF while the button is held, and ON when released. You can get even further down the rabbit hole when you assign a button shortcut to a slider parameter. Let's first set up a fun parameter to play with. Put the Invert RGB effect on a clip. Leave all its parameters alone, but just change the effect's Blend Mode to TimeSwitcher. You can now strobe the inverted clip, using the Opacity parameter to control the rate. Pretty cool, right? 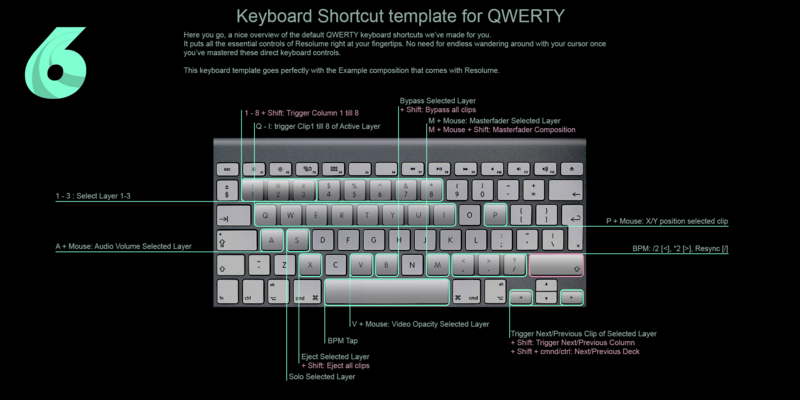 Now go into Shortcuts mode, and assign a shortcut to the Opacity of the Invert RGB effect. Let's go with the ']' key. You will see new options appear in the Shortcuts tab. The biggest one is a big slider called "Range". You're now assigning a button shortcut to a slider, and a slider has more values than just on and off. With the Range option, you can see what values the slider should jump to when the button is pressed and released. Let's set the values to 0 and 0.10. You can either drag the in and out point with the mouse, or click the values and enter them numerically. After you exit Shortcut mode, you can now hit the ] key to strobe the clip with 10% opacity and off again. Braaaaap! In this mode, you also have the Piano option. Br-Br-Braaaap! Instead of just toggling, a button can also be used to set a slider directly to a specific value. In the shortcuts panel, you can change the Mode from Toggle to Value. Don't worry, we'll cover Mouse as well. Be patient, young grasshopper. In Value mode, you can use the keyboard to set a slider to a specific value. So pressing ] will set the Opacity of the Invert RGB to 0.10, regardless of what it was set to before. This is great for resetting a parameter to a certain value. Multiple shortcuts are especially awesome! You can assign more than one shortcut to a parameter. Simply select the shortcut, right click it and select 'Duplicate Shortcut'. You will see that ] is now used twice as a shortcut for rotation. By clicking one of them, it becomes selected and you can change it to whatever you like, just by pressing a different key. Let's go with [ and ] as the two keys. Now each shortcut key can have different settings. Let's set both keys to Toggle Mode, with Piano turned on. Set the range of the first shortcut to 0 and 0.05. Set the range of the second shortcut to 0 and 0.1. Now you can strobe the invert effect at different rates. Because they're set to Piano and the minimum range for both shortcuts is 0, releasing any button will always turn the effect off. Tip! If you're not that big on blinding your audience with epileptic strobing, you can also think of things as using multiple keys to set the Hue of a Colorize effect to specific values. This way, you can quickly match the color of the video to the color of the lights. For instance, shortcuts for Layer Opacity default to By Position. Because you probably always want your first fader on your MIDI controller to control the first layer in your composition, regardless of how you re-order the layers afterwards. When assigning shortcuts for these controls, you enter a whole new level of sophistication. This is where you go from someone who mashes buttons to a distinguished shortcut connaisseur. The most basic one is assigning a shortcut directly to a particular 'item'. Item sounds a bit strange perhaps. It simply means you could for instance assign one key to play the clip forwards and another key to play the clip backwards. You do this simply by selecting the buttons in the interface, and assigning a key to them. You will see which state you have assigned in the Mode box. The same way, you could also assign shortcuts for each Layer Blend Mode that you like, or for the Auto Size options on the layer. Piano is also available as an option when you assign a shortcut directly to an item. When Piano is toggled on, pressing the shortcut will switch to that item, and releasing it, will switch it back to whatever is was set to. This way, you can quickly set the clip to random playback during an especially hectic part in the music, and then release the button to go back to whatever direction it was playing at before. It get a bit crazier by using the Select Next Item, Select Previous Item and Random Item options. By selecting these, you can cycle through every item in that group of controls. This way, you can for instance cycle through all the layer Blend Modes. You just keep on pressing the same button until you land on one you like. If you really want to get to the nitty gritty of shortcut control, try duplicating the shortcut, and then assigning it to a different item in a group. For instance, assigning the same key to both play forwards and play backwards, will let you toggle between these options with one button. Back and forth. Back and forth. Back and forth. If you really want to go full control ninja, you can even use Piano in combination with this. You can assign as many items to the same key as you like. Resolume will cycle to the next assigned item on every key press. There is one specific mode that is only available for keyboard shortcuts. It's called Mouse, and I know that sounds weird, but it's pretty awesome. In Mouse mode, you can use the mouse to control a parameter while you have the shortcut pressed. For instance, you can assign the P key to a clip's Position X. Switch to Mouse mode and set the range to -960 and 960, or whatever your composition size is. When you now press the P key, horizontal mouse movements control the clip's horizontal position. I bet you know where this is going now, right? Assign the P key to Position Y also. Switch to Mouse mode, but now switch to Vertical. Set the range to -540 and 540, assuming you have a 1920x1080 comp. Now holding the P key will give you full control of the clip's position. Releasing the P key will freeze the clip where it is and let you use the mouse for pointing and clicking again. Resolume ships with a default shortcuts layout that we think is kind of useful. Of course you're free to modify it how you see fit, or completely ignore it. Resolume is freedom. Peep the shortcuts here, yo.